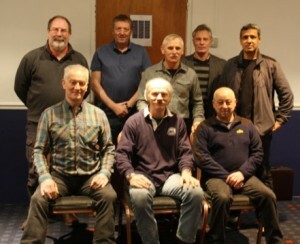 On 11th January 2014 a historic meeting took place at the Holiday Inn Birmingham where representatives of the following Aikido organisations met to ratify their organisations’ departure from the British Aikido Board and coming together under the banner of the Joint Aikikai Council. The JAC is open to all Aikikai Hombu Dojo recognised groups and will offer Aikikai standard practice in all their dojos. From 1st February 2014 all members of the above organisations are now members of the JAC. All organisations will continue to act independently and come together for one course annually. All insurance will now be administered through the JAC. Front Row: Gordon Jones – UKA (JAC Chairman), Guy Needler – UKA (JAC General Secretary), Nick Waites – KAA.